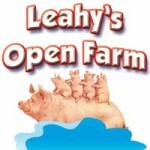 Short Business Description: Leahy’s Open Farm offers you a fun, exciting and adventurous day out, suitable for all the family from babies right up to granny’s and granddads. You can help feed the camel, kid goats, hens and ducks. Hold the snake, rabbits and mice. Leahy’s Open Farm offers you a fun, exciting and adventurous day out, suitable for all the family from babies right up to granny’s and granddads. Petting times with the animals are 1, 3 and 5pm daily. This is the highlight for many children, where else would you hold a snake..
Have you ever operated a real JCB Digger? Well here is your chance. These real JCB diggers are suitable for all ages, however, kids under the height limit must be accompanied by an adult. We have a huge mystery maze, climbing frames and adventure playground. Try your hand at Crazy golf, or speed around the go kart track. We have a lovely coffee shop with our own delicious home baking and tasty treats. There is an extensive museum on display at the farm, showing all the old machinery and equipment used in bygone days. Large indoor soft play area “Playbarn”. We cater for Birthday parties, school tours and summer groups. Special rates apply. We run special events at Easter and Christmas, our Monster Easter Egg hunt is on over the Easter Weekend and Santa’s Village runs for the month of December. We are a family run business and every day we follow one simple rule and that is.. So what are you waiting for, we will see you soon..
Free parking, no time restrictions on your day out, wheel chair accessible, baby changing area, high chairs available. Trabolgan Holiday Village in east Cork is Ireland’s favourite family holiday destination. Located on 140 acres of woodland Trabolgan has 172 self catering houses and 35 touring caravan pitches. It is the perfect location for family holidays, short breaks, day visits, school tours, corporate team building, special events or for members. * A range of Adventure Sport Activities including – Go Karts, Quad Bikes, the Trabolgan Tower (Abseiling, Zip Wire, Climbing), Combat Laser, Water Walkerz, Bounce Zone (Bungee Trampolines, Bungee Run, Inflatable Obstacle Course), Archery, Mini Karts & Mini Trampolines. * A host of Restaurants, Bars & Shops.